Our Round Annapurna Trek circumnavigates the Annapurna mountain range, passing dense forests, marvelous mountains, and mixed cultures. At first you will be guided towards the paddy pasture before cutting across the Marshyangdi River and then passing through attractive villages including Bhubhule, Taal and Pisang. Muktinath is a major highlight of the trek as it is considered as a sacred place and a pilgrimage site for Hindus. We follow the Kali Gandaki River upstream all the way through a natural and diverse sequence of landscapes. Visitors will be amazed seeing the distinction from lowland 1000m forests to 3800m lunar-like desert landscapes is the most fascinating part of the trek. 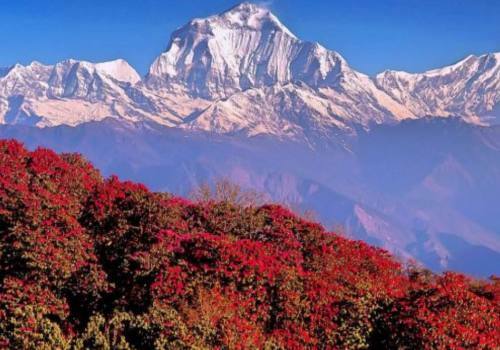 The surrounding Annapurna mountains like Dhaulagiri, Nilgiri tower over us with their snow capped peaks. 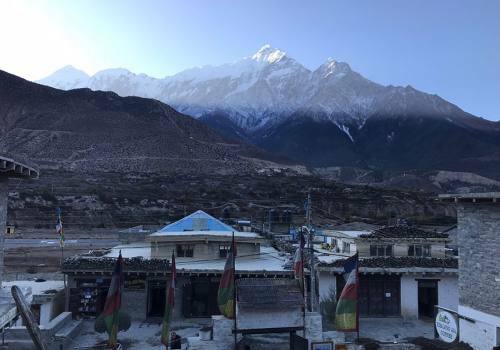 Round Annapurna Trek is an exciting trek which provides the mixture of adventure by combining parts of Jomsom Muktinath Trek with the parts of the Annapurna Base Camp Trek. 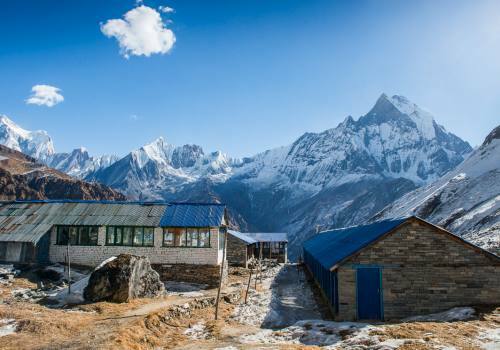 It is entirely around the famous Annapurna Massif with the area's charming cultural allure, everyone with their own language, unbelievable views of abundant Himalayan peaks and continuously changing landscape. Starting with a drive to Besisahar you gradually go up along the Valley of Marsyangdi River. There are countless attention-grabbing things along the trek. Do not miss out! You can even visit Braga (Buddhist monastery), while travelling around the Manag village. We'll also see Thorong La, Dhaulagiri ice flow, viewing sunrise and many more. You cannot count the number of wonders on this trek on your two hands. Day 03Drive from Kathmandu to Besisahar (827m), and jeep from Besisahar to Syange (950m)You will take a bus and drive to Besisahar or to Bhulbhule from Kathmandu. On the way we can see the lifestyle found in rural communities, which are surrounded by rivers and pastureland. Besisahar is a “sahar” which supply the daily requirements for the villagers near to it. You can find an average type of climate in Besisahar. Overnight stay at a guesthouse. Day 04Trek from Syange to Dharapani (1943m) Leaving the ridge, we descend to the river towards Syange, a village along the banks of the river. There is a beautiful waterfall. Crossing the suspension bridge, we climb uphill for an hour and a half until we reach Jagat. There is a hot spring near Mashyandi River, about 15 minutes walk from the main village. There is also a temple for the goddess. The beautiful sceneries viewed from Jagat are Chipla and Jhitai villages, with high and steep slopes where magnificent, well-engineered terraced hillsides can be found. We continue on, crossing another suspension bridge, and eventually reaching Dharapani. About 10 minutes up the hill from Dharapani, there is a Thorong La Village, where there is a 104- year old Buddhist Monastery. Day 05Trek from Dharapani to Chyamje (2713m) On the 7th day of our trek, we will move into Chyamje (2713m). In Chyamje, basically we will be surrounded by lush forests with massive mountains in our background. We will travel through a thick forest, enjoying the waterfalls on the way to our destination. Chyamje is working as a trade center for the Manang district. Overnight at guesthouse. Day 06Trek from Chyamje to Pisang (3292m) For the trek to Pisang we'll follow the path over a narrow river valley with dense forests. Our exhaustion goes away after we see the best mountains views of Pisang (3292m). It takes about three hours to arrive there. Overnight at guesthouse. Day 07Trek from Pisang to Manang (3351m) For the trek to Manang, there consists two ways. Both routes can be followed. Afterward, we cross the Jharsang Khola. There lies a Gurung village known as Khangsar where you can find a small monastery and prayer flags. 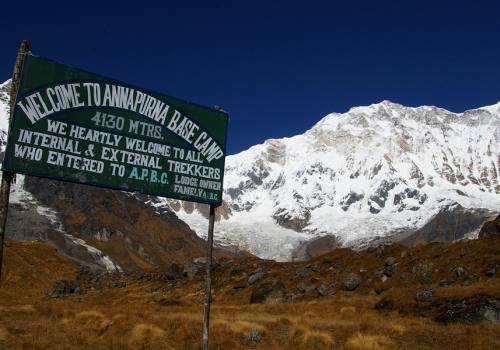 Through this trek you will get an opportunity to view magnificent view of Annapurna Himal. Overnight at guesthouse. Day 08Rest day This is a rest day to acclimatize to the higher altitude. Use the time visiting monastery, and/or a side trip to Gangapurna Lake. You can also visit Himalayan Rescue Association Clinic. Taking some rest in this day will help us feel energized for the trekking to come. In the evening you can explore around the area. Overnight at guesthouse. Day 09Trek from Manang to Yak Kharka (4200m) You will take a walk throughout the colorful settlement of Manang by following the path of stone walls and sandy path. You will arrive to Yak Kharka village after passing through Koche village. Koche is famous for grazing animals. In the pasture land grasses and varieties of seasonal flowers are found. It has glaciers and other water resources, making this place very attractive. Overnight stay at a guesthouse. Day 10Trek from Yak Kharka to Thorong Phedi High Camp (4780m) Today you will carry on to the direction to Thorong Phedi High Camp (4780m). After reaching there you would not be able to view any trees. It is a majestic high alpine landscape. Then, you will ascend to the Base Camp. Thorong Phedi is popular as a tiny village situated near the Marshyandi River. Below the river there is a huge meadow land. Overnight stay at a guesthouse. Day 11Trek from Thorong Phedi High Camp to Muktinath (3802m) Muktinath is a holy place for both Hindus and Buddhist. We need to climb another 1000 meter to reach Muktinath. First of all we walk all the way through Khingar (3400m) continuing to Jharkot (3500m) which will be an inspiring stronghold for natives. If you are planning to carry on the first part of Muktinath, we will be staying that night at Ranipur to acclimate more steadily. It has other advantages too. That will give us some time to visit Hindu places and to see the sights near the areas. Overnight at hotel. Day 12Trek from Muktinath to Jomsom (2720m)On the 12th day the trek continues throughout the Kali Gandaki Valley to Marpha. Marpha is supposed to be home for many apple orchids as well as all the range of food products. Apple Brandy is a local area of expertise. It is said that if you got an opportunity to taste that Brandy you are a lucky one. Overnight at guesthouse. Day 13Fly or drive from Jomsom to PokharaWe head back to Pokhara for sightseeing about the area. There are temples we can visit, and there are also plenty of other activities such as canoeing, biking, and generally wandering around. Phewa Lake is a beautiful place to hangout, and it offers stunning panoramic views of the Annapurna range. Day 14Return to Kathmandu From Pokhara you will return to Kathmandu taking nearly 6 to 7 hours. On the way you can enjoy the beautiful scenery from the window and during the stops we can get out and capture some photographs. On the way you can take your lunch. Overnight stay in a hotel. Day 15Departure!!!! We will transport you to the airport. Thanks for trekking with Adventure Himalayan Travels. We look forward to seeing you again! 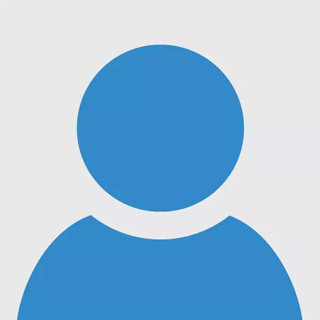 “Can't recommend enough. Corresponding with Rana before the trek over email was easy and he was very helpful and responsive dealing with our (many) questions. Our guide Chitahang was knowledgeable, friendly and extremely helpful and our Porter Vishnu and Subash were also great company and very kind. Adventure Himalayan arranged for all of our accommodation ahead of time, reviewed our blood oxygen levels every morning and evening ahead of time and also suggested side treks we could go on along the way. Thank you , Rana and Adventure Himalayan team”.